The NEXT update for No Man’s Sky is coming and Hello Games has put together a video detailing 11 things that have changed since launch. Hello Games will release No Man’s Sky on Xbox One soon, and players can expect plenty of changes alongside the 11 mentioned in the video. New and returning No Man’s Sky players can expect new difficulty levels, weapons, base building, bounties, quick travel to planets, additional exocrafts, and new missions and story. Quick travel to planets is made possible by using Stargates, and each star system has its own conflicts, enemies, and economy. New biomes provide players with various areas in which to build a base. Here, players can create their own buildings, various facilities, grow crops, and recruit aliens. Each planet also allow players to change the terrain in order to explore previously inaccessible areas. Additional story and missions provide extra content along with four difficulty levels: creative, normal, permadeath, and survival. Crashed freighters feature more reward items, providing players with a greater incentive to explore them. Freighters can also be purchased, and used as an interstellar mobile base. The freighters can also be customized. Enemy AI has improved, and battles are more challenging. Al of the changes noted above are included in the previous updates Foundation, Pathfinder and Atlas Rises. The NEXT update for No Man’s Sky, which adds multiplayer, will be released July 24 on PC, PS4, and Xbox One. 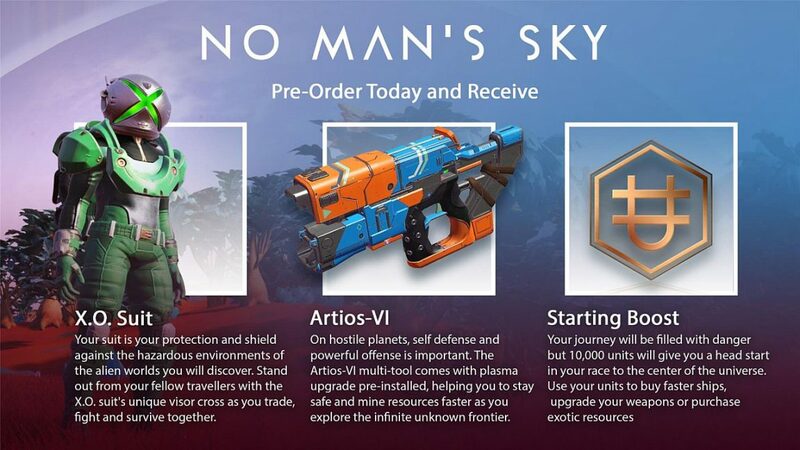 Pre-orders are live for the Xbox One version of No Man’s Sky. Dropping the cash early will net the following bonuses: X.O. Suit, the Artios-VI multi-tool with plasma upgrade, and 10,000 Units as a head start.